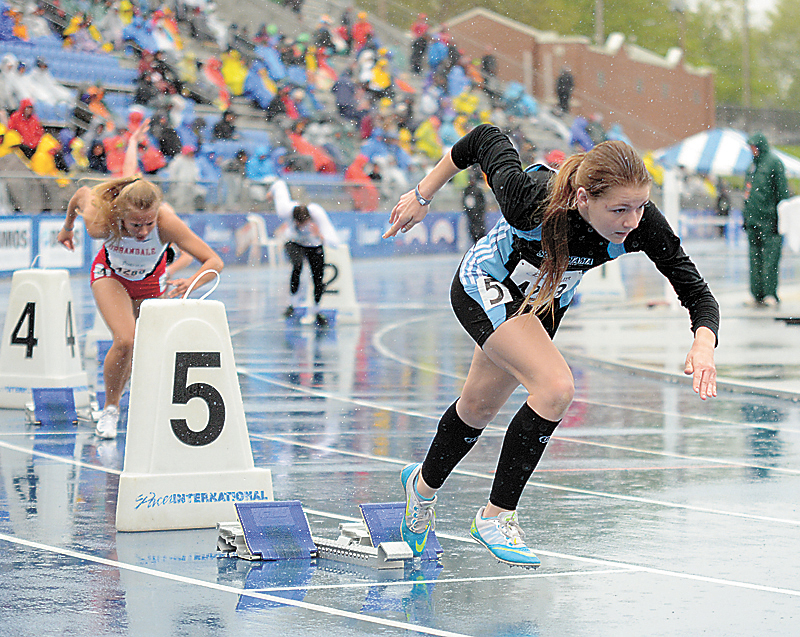 T-R PHOTO BY STEPHEN KOENIGSFELD • South Tama County’s Allison Yuska jumps out of her starting blocks and into the rain at the gun of the 400-meter hurdles Saturday at the Drake Relays. Yuska placed seventh overall in a time of 1 minute, 6.38 seconds, a season-best by one-hundredth of a second. DES MOINES — Allison Yuska gave a mischievous smile after dodging the rain Friday afternoon at the conclusion of the 4×100-meter preliminaries. But Mother Nature had the last laugh. 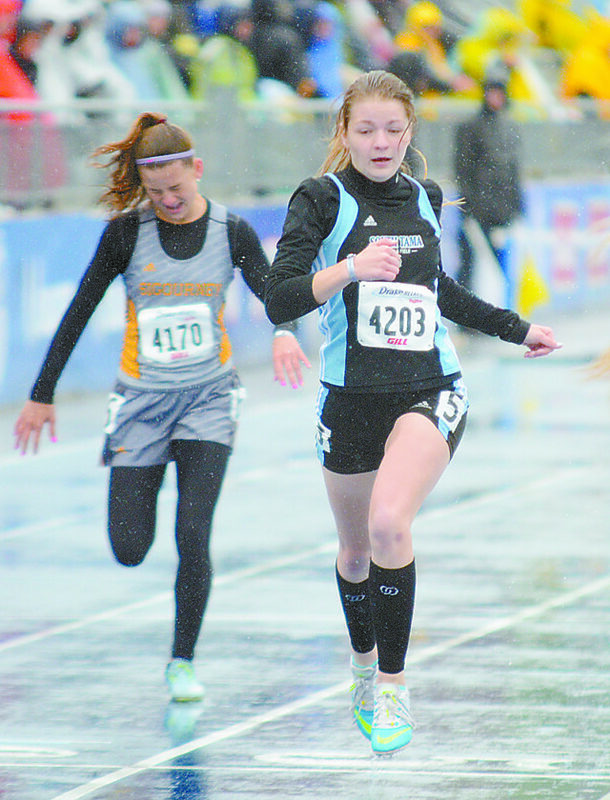 The rain was in a downpour for Yuska as she stepped into her blocks for the 400 hurdles on Saturday, providing an eighth competitor for the South Tama County hurdler. But no matter, as the senior vaulted the obstacles on her way to a seventh-place finish, running a season-best time — by one one-hundredth of a second — in 1:06.38. The rain peppered her legs along the backstretch, and coupled with the cold, Yuska said she was unable to feel her legs. It was a strange feeling, not being able to recognize the pain. 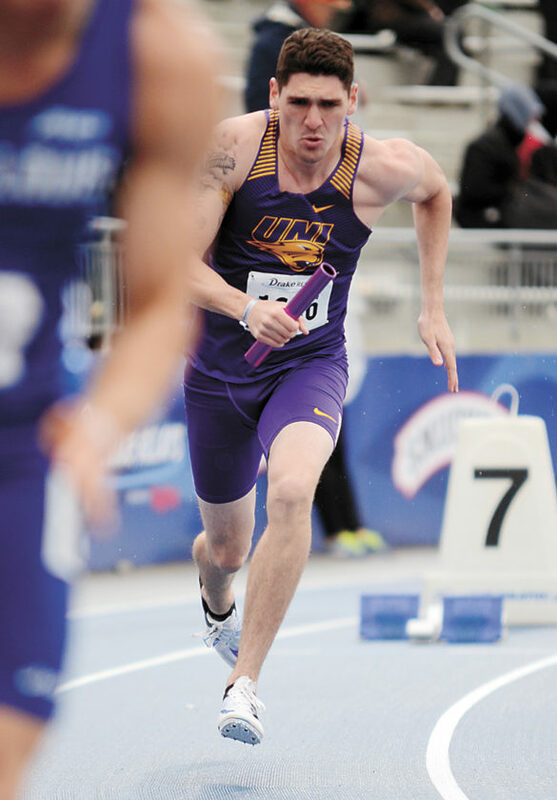 T-R PHOTO BY STEPHEN KOENIGSFELD • Northern Iowa’s Bryce Newcomb sprints out of his starting blocks at the beginning of the university men’s 4x400-meter relay. Newcomb, a former GMG standout, led off the relay as the Panthers took fourth in a time of 3 minutes, 15.59 seconds. The start was just as wet as the end as Yuska trounced through a couple puddles past the finish line. But the magic of the Relays was never lost on the South Tama senior. Yuska ran the anchor leg of the 4×100 Friday and has made the trip to the Relays before. Warming up with collegiate athletes gave her confidence, but also left her in awe as she watched some of the best next-level hurdlers burst around the same track, in the same conditions. 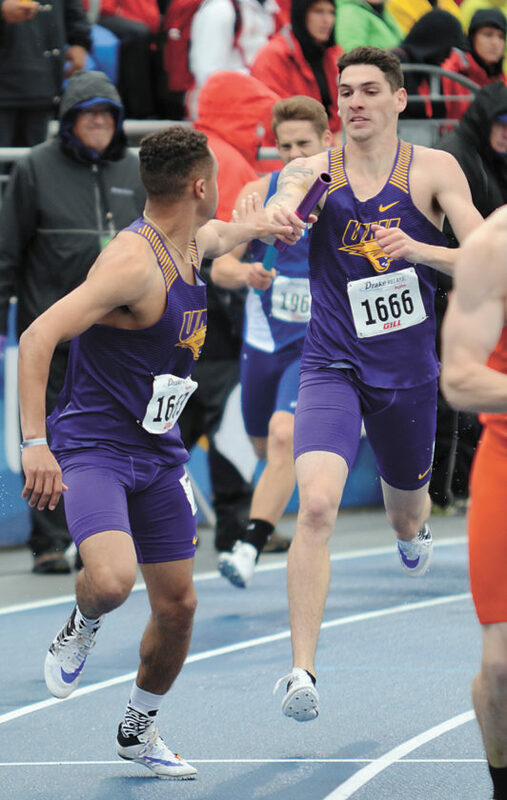 One of those ‘next-level’ athletes is Northern Iowa sophomore Bryce Newcomb, experienced the Drake Relays again, this time as a collegiate athlete. Newcomb led off the Panthers’ 4×400 relay that took fourth in a time of 3:15.59. Newcomb said he’s come a long way since his prep days at GMG High School. Just a jumper back then, he never thought he’d be running in the Relays. But now that he’s returning to the Blue Oval, he said the caliber of the meet still hasn’t been lost on him. Newcomb said the Panthers’ 4×400 team has been relay by committee at times this year. 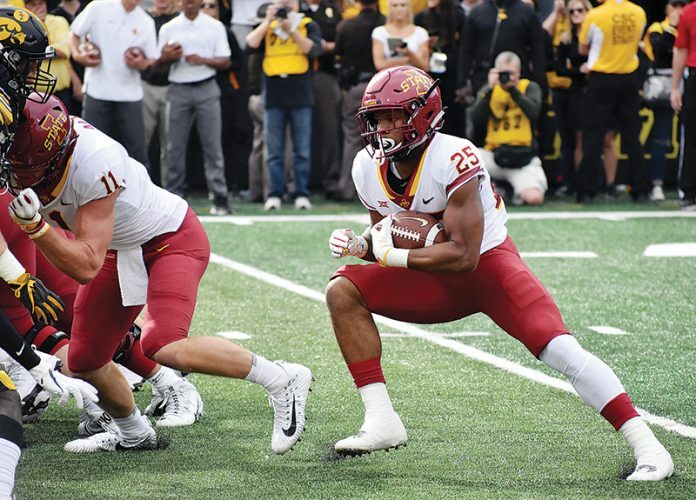 Coming into Drake, the relay sat toward the bottom of the Missouri Valley Conference. With not much to lose, the Panthers turned loose on Friday and ran a qualifying time of 3:12.67. 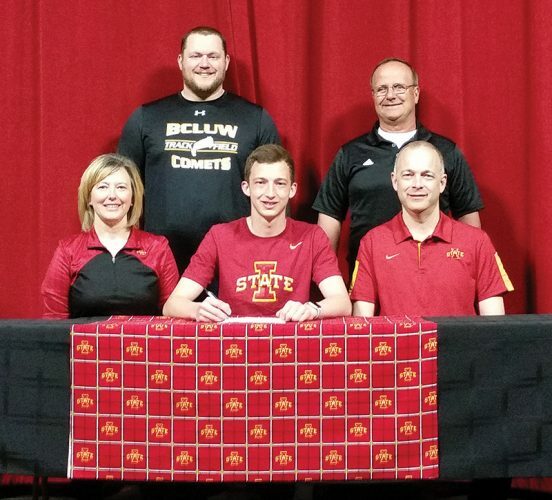 Newcomb and the Panthers will head to the Wisconsin Twilight meet on Friday before a trip to the MVC Outdoor Championships in Wichita, Kan., on May 11-14.